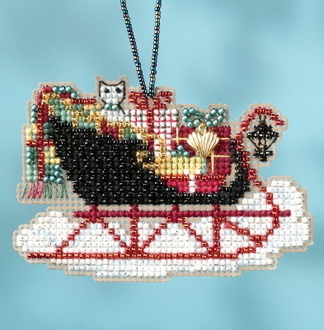 A lovely Ornament kit depicting a Christmas Sleigh with presents and a cat peering out, embellish with the included Mill Hill charm. Makes one ornament to hang. Finished size: 3.5"w x 2.25"h (8.9cm x 5.7cm). Mill Hill Glass Beads, Charm, Mill Hill 14 count Perforated Paper, floss, needles and chart with instructions.